:Max Lucado explains why the cross is the symbol for our faith. A best-selling tract in Spanish. 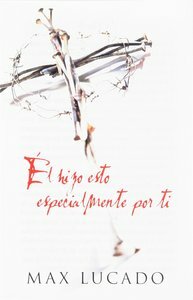 About "He Did This Just For You (Spanish, Pack Of 25)"
Max Lucado loves words - written, spoken - it does not matter. He loves to craft sentences that are memorable, inspiring and hopefully life-changing. In almost 25 years of writing, more than 65 million books filled with his words have been sold. Max is the only author to have won three Christian Book of the Year awards - in 1999 for Just Like Jesus, in 1997 for In the Grip of Grace, and in 1995 for When God Whispers Your Name. In 2005, Reader's Digest magazine dubbed him 'America's Best Preacher' and in 2004, Christianity Today magazine called him 'America's Pastor.' The product line for 3:16 - The Numbers of Hope sold more than four million units worldwide, including one million units of the book of the same title (released in September 2007), making it the fastest selling Lucado product in his career. His works have appeared on every major national bestseller list including Publishers Weekly, USA Today, The New York Times, Evangelical Christian Publishers Association, and Christian Booksellers Association. He has been featured in countless media outlets and national broadcasts. Max's writings have been published in a wide array of formats including adult books, gift books, children's titles, Bibles, commentaries, calendars and devotionals. He is also the author/creator of Max Lucado's Hermie and Friends brand family, one of the most popular animated DVD series in the marketplace, with more than 5 million units sold to date. His words have also inspired a branded line of greeting cards and gift books for Hallmark/Dayspring that has sold more than 15 million copies since its 2001 debut. Max Lucado is a Minister of Preaching at Oak Hills Church in San Antonio, where he has served since 1988. He has been married to Denalyn Preston Lucado since 1981, and they have three grown daughters - Jenna, Andrea and Sara and one son-in-law, Brett. In 1991, Max Lucado was presented the idea of developing a radio broadcast that focused solely on Jesus Christ. As a result, the vision for UpWords Ministries was born. Since that time, 'UpWords, with Max Lucado' has changed from a 15 minute, daily feature to an inspirational one minute message. Today, UpWords is heard in over fourteen hundred radio markets around the world. Along with the inspirational radio program, UpWords provides a comprehensive library of full-length CDs as well as many downloadable audio files of Max's weekly sermons delivered to his home church in San Antonio, Texas. UpWords exists for the sole purpose of encouraging others to take one step closer to Jesus Christ. The staff of UpWords is prayerfully dedicated to this purpose and is constantly humbled to see God's hand at work.